I'm backpacking across Europe with a very large (70 liter) backpack, plus a smaller daypack (35 L). I've found myself taking a number of trains, with different available facilities and passenger loads, and am wondering what the proper etiquette is when hauling around rather large luggage. The English and Welsh trains that I rode have a luggage rack at one end of the car, and sometimes between seats in the middle of the car. Travelling with a backpack, should I try to put my pack on a particular shelf? If the rack is full, can I stack my pack on top of other luggage? The ScotsRail train I rode from Newcastle to Edinburgh had no luggage racks and a very small overhead rack that could not fit my pack, nor could it fit on the floor under/in front of the seats. Is it acceptable to place my large pack on the seat adjacent to mine? What if the train is full up (standing room only)? I'm looking to learn about general luggage etiquette on trains, specifically those without dedicated luggage compartment or staffed baggage handling. IE: the situations where I carry a large backpack or other luggage onto a train and then need to decide what to do with it. The only source I can offer is personal experience and opinion for UK trains - I don't think anybody can give you a universal one for all of Europe, as expectations (and rules) vary quite a lot. Consult the websites of the various train operators, or national organiser of each country you visit for local rules, although don't expect anything on etiquette. Note that other travellers may disagree with the below ideas. The core philosophy I am using is about minimizing the impact you have on other passengers, while still having a reasonable journey yourself. If you have big luggage, and there are luggage racks available, please use them. As a regular travellers, it's frustrating to see people taking seats or causing obstructions with luggage when there is space. If the luggage rack is near full, but would take your bag with some rearranging, then go ahead and do it. You may get some people eyeing you as you do this, but it's still better for all than either crushing somebody elses stuff, or causing obstructions. If the racks are completely full, but the seats aren't (common for airport trains), do look around for other less obvious racks. After that, bags on the seat are acceptable, provided you look around at every stop and see how many people are getting on. If it gets busy, move your bag. Areas near the doors, and in the "vestibules" (the bit between carriages) are often used as impromptu luggage storage. If you arrange so that people can still get on and off, nobody really minds. Do move it to storage space if some comes clear. If the train is really full, but you can get a seat, consider taking your luggage on your lap. It's uncomfortable, but there's nowhere else for it. Try to avoid taking large items on luggage on busy commuter services - so those that arrive at major city between 08:00 and 09:00, and leave between 17:00 and 18:15 and are running short distances. These are likely full of people already, and squeezing on with your backpack won't make you popular. Don't try and wear your backpack, even if you are forced to stand. Take it off and place it at or between your feet. This way you are unlikely to hit anybody in the face with it. Note: on some Gatwick Express services, bulky items such as skis are conveyed free in the luggage van. There is plenty of space on board for other luggage. Check with operator for more details. I've never seen this enforced, but user Dewi Morgan indicates that it is at times when many people are attempting to bring lots of items on to the train. I can provide personal experience from Germany, Denmark and Sweden. In all three of these countries, as long as you can get your stuff on the train within a reasonable time, there should be no problem in taking seemingly excessive amounts of luggage. I travelled through all of Germany with a large trolley case, a medium-sized rucksack, a fabric-shopping bag and a cardboard case that contained a PC monitor. I travelled to Sweden via Denmark with (this is the largest number of pieces of luggage I had) the same large trolley case, a sleeping bag, an air matress and the same rucksack as above. I also saw quite a few people travel to music (especially metal) festivals by train (myself included) with their tent, a camping chair, table and two crates of beer. Usually, there will be enough space in the overhead racks to put luggage, since most travellers will not have that much. Occasionally, you may require reordering other people’s luggage. In that case, I found it beneficial to look around, ask a quick ‘Is this your’s? May I shift it so my stuff fits, too?’, generally met by ‘yes, go ahead’ gestures and/or answers. In some trains (anything that goes Hamburg–Copenhagen pops up to mind) there may be not as much space, so also spaces between back-to-back seats are also used. If in any way possible, try to not have your luggage obstructing the aisles, vestibules or exits. Depending on the conductor’s mood, they may require you to remove luggage from there so evacuation is possible. If the trains have a bicycle compartment and there are no bicycles travelling along, go there because there is a lot of free space there. Caution though: Bicycles typically get priority. I have not yet come across a luggage car or any other way to store luggage away from oneself in the countries I mentioned except for historic trains operating only on special occasions. I have travelled by train in Norway, Sweden, Denmark, UK, Netherlands, Belgium, Germany, France, Switzerland, Austria, Liechtenstein, Spain, and Poland. In some trains in some countries, there is plenty of space for luggage. 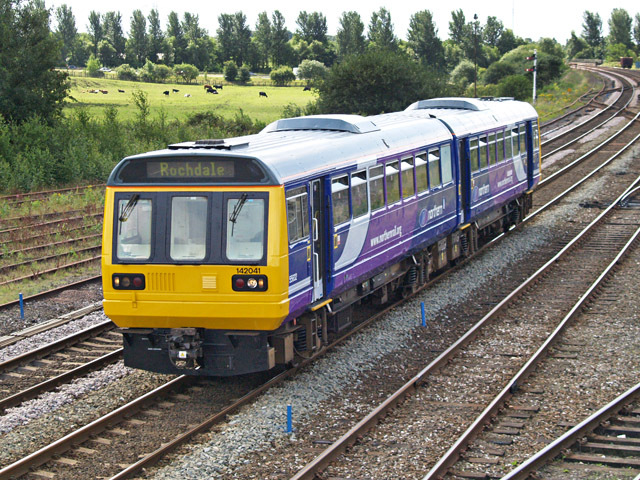 An example of that are Crosscountry trains in the UK, which have a dedicated storage area in the middle of the train. I'm often on very full Crosscountry trains, and some people actually use the storage area to sit down when all seats are taken. I've never seen more than 25% of this dedicated storage space used for luggage. The other extreme are the Spanish Elipsos Trenhotel sleeper trains, that used to run at night between France/Switzerland and Madrid/Barcelona (Trenhotel apparently still exists domestically, but I don't know if the material is the same). I had one large suitcase in a sleeper car, and I was told to put it on my bed. There was nowhere else to put it, it seems they assumed nobody ever has any luggage whatsoever. Finally we put it on the floor of the compartment after all had gone to bed. Most trains are somewhere between those extremes. The bottom line is that the variation in availability of luggage storage is so vast that there is no simple answer to give for all trains. A 70 litre backpack is not too large and you should manage on any train, but if you travel with more than two large suitcases — say, anything for which you would use a luggage trolley on a station (where those exist) — you should find out for the specific trains you are taking whether you should expect trouble (which can range from having to sleep on top of your suitcases to being rejected onto the train). It's always possible to ship luggage, although of course this can be costly. Regarding your ScotsRail journey or any other 'small train' journey (2 to 4 carriages, see below image of example) in the UK. There is no set rules re: luggage, just common sense. The racks above seats are not big enough for medium - large pieces of luggage. If the train has space, you are allowed to put your luggage on another seat next to you. In the unlikely event of the train being full, then I would stand with your luggage either in the aisle or at either end of the train/vestibules. If you have small items of luggage, please do not put it in the racks for larger items of luggage, since that forces people with larger items to block the aisles and vestibules. So, in the first instance, try and get your item of luggage in the overhead rack, before opting for the larger racks. Not the answer you're looking for? Browse other questions tagged trains luggage europe etiquette or ask your own question. Luggage limit in trains in West Europe?